THE CAT and ASTROLOGER | – Public House serving horoscopes, astrology articles and the – very – odd beer! 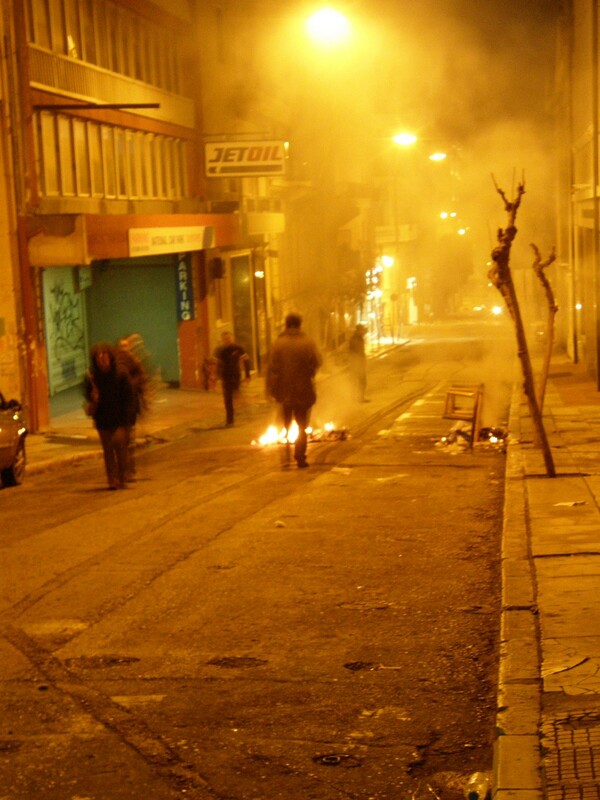 February 13, 2012 “Counterpunch” — On Sunday, the Greek parliament approved a new round of austerity measures that will further deepen the 5-year depression and sever the last fraying threads of social cohesion. In order to secure a 130 billion euro loan, Greek political leaders agreed to comply with a “Memorandum of Understanding” (MOU) that will not only intensify the sacrifices of ordinary working people, but also effectively hand the control of the nation’s economy over to foreign banks and corporations. The Memorandum is as calculating and mercenary as anything ever written. And while most of the attention has been focused on the deep cuts to supplementary pensions, the minimum wage, and private sector wages; there’s much more to this onerous warrant than meets the eye. The 43 page paper should be read in its entirety to fully appreciate the moral vacuity of the people who dictate policy in the EZ. That’s right; according to the author’s of this fuliginous memo, the only way Greece is going to be able to lift itself out of the doldrums is by poisoning its kids with banned baby food. The MOU also calls for a 10 percent cut to government workers wages, cuts to “social security funds and hospitals”, and more privatizing of publicly-owned assets, all of which will only further shrink GDP. Well, that’s pretty clear: Capital Rules. The interests of corporations and banks will take precedent over those of the people. The proclamation limits the role of government to rubber stamping the predatory actions of cutthroat speculators whose only interest is fattening the bottom line for their shareholders. Don’t you think, dear reader, that if you had recommended policies that resulted in a severe two-year recession and record-high unemployment (Greek unemployment is now at a peak of 20.6 percent), that you’d keep your mouth shut and admit that you don’t know what the hell you were talking about? Not if you were a EU finance minister, you wouldn’t. You’d prescribe the very same policies that had failed throughout; the policies that have reduced spending, shrunk government revenues, increased joblessness, and deepened the slump. This is the type of idiocy that passes as policy in the eurozone. Ka-ching! More freebies for big business. The whole memo reads like this, just one corporate handout after another. “Implementation of law 3982/2011 on the fast track licensing procedure for technical professions, manufacturing activities and business parks and other provisions”. So even taxi drivers get a spot at the trough? Doesn’t that seem a bit irrelevant? None of this has anything to do with helping Greece. It’s just corporate pillaging gone haywire. Greece is a big pinata that’s just been cracked open and everyone is pushing and shoving to grab their fistful of candy. 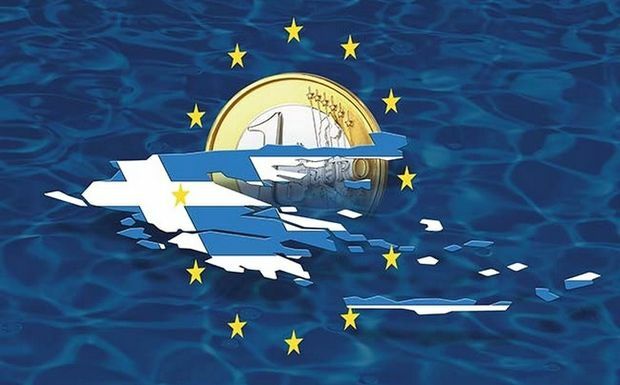 If Greece wants to increase its revenues, then why restrict the pursuit of tax cheats? Isn’t that counterproductive? This is just another sign that the Memo was crafted by powerful men operating behind the cover of their political lackeys. Sure; just let big finance and corporate elites “streamline” the courts or load the bench with their “picks” and lawsuits will be cut in half. What does say about the men who authored this text? You can see what a farce this so-called Memorandum of Understanding really is. It won’t help Greece emerge from its depression, and it won’t lead to more eurozone integration. It’s just another feed for the corporate hyenas. What Greece needs is a radical restructuring of its debt. It needs to wipe out bondholders, recapitalise its banks, and increase fiscal support until the economy gets back on its feet. Another loan package won’t help to achieve those goals. It will only delay the day of reckoning. It would be better for everyone, if the country defaulted quickly and began the process of digging out now rather than later. Describes Germany’s secret plans , not only for Britain, but also on other countries in the Eurozone, in particular the ones with fiscal problems. Amidst the Eurozone crisis, Greece has been undergoing its own fiscal plight for two years now. This has come to the dramatic events of the last two weeks, which ended in , with the mutual agreement of the two majority parties and one minority party, the election of Mr. Lucas Papadimos as the n ew Prime Minister , for a transitory period ( length still uncertain) . Who is Lucas Papadimos, the new Greek PM? ”During his time as Governor of the national bank, Mr Papademos was involved in Greece’s transition from the drachma to the euro as its national currency. In a speech made at the Euro Information Conference in 2001, he praised the euro for shielding small economies from the “exogenous shocks” that emanated from the September 11 terrorist attacks in America. Mr Papademos argued the euro ensured price transparency and increased competition, concluding: “The macroeconomic and microeconomic benefits for Europe and Greece from the introduction of the euro are numerous”. After leaving the Bank of Greece in 2002, Mr Papademos became the Vice President to Jean-Claude Trichet at the European Central Bank, before leaving the position in 2010 to serve as an advisor to Mr Papandreou. A Libra Sun, with a wide conjunction of Sun with Neptune, Mr. Papadimos appears as a polite man, and could have idealistic interests, and other aspirations, and inspirations, indicated by Neptune , which can cause a subtle form of ambition or self-importance . He is stable and organized in pursuing goals ( sun sextile Saturn) , as well as strong, enduring and very determined in his aims ( Sun sextile Pluto). The presence of Pluto and Satun in the 11th house , trining the Sun, signify the support he receives from old , well-established and determined,strong structures which belong to a wider group. Venus in Libra, as well as the Sun, aids him in relating with grace and diplomacy to others. His success as an economist, is denoted by Mercury in Scorpio( 2nd house) square Pluto and widely square Saturn in Leo in the 11th house, signifying an intuitive , perceptive, and determined mind, that can carry out plans in secret, and plot, if need be. The square to Saturn gives the ability to carry out plans slowly, patiently and payning attention to detail. The above traits are indeed useful to a financier. We see an exact square of Venus to the Sun, both at 17 degrees og Cardinal signs. The square signifies a great effort with small results, while Venus signifies relationships, as wel of course as fiscal matters. In addition, the prog. Moon is close to forming a conjunction to prog. Venus and a square to Neptune ( we cannot unfortunately know the exact position of the Moon, as we don’t have the exact time of birth) indicating a misleading situation, the aspects of which cannot be clearly known – an aura of conspiracy, or a ‘set-up ” situation is likely. Still, prog. Mercury in conjunction to prog. Jupiter, in sextile to natal Neptune, shows the existing optimism -grounded or not- and wider fame, as well as the support he has in this venture from foreign sources ( Mercury rules the 9th house and is in Sagittarius, conjunct Jupiter). The conjunction, is in square to the natal Moon ( again , if the position of the Moon were exact), signifying great mobility of mind, many contacts , discussions,communications, nervousness, much travelling, a change of residence, but can be at odds with other figures of authority regarding practical matters, as the Moon rules the 10th house and is in Virgo in the 12th house. The prog. Sun is in trine to Natal Saturn, signifying stability, form, and support from established, strong structures in authority , as wel as taking on great responsibility. In the Solar Arc chart, we notice that S.A. Mercury is in square aspect to the Sun. As Mercury rules the 9th house and is in Scorpio in the 2nd, it means that strong pressure will be applied by foreign forces, in order to achieve their financial goals. 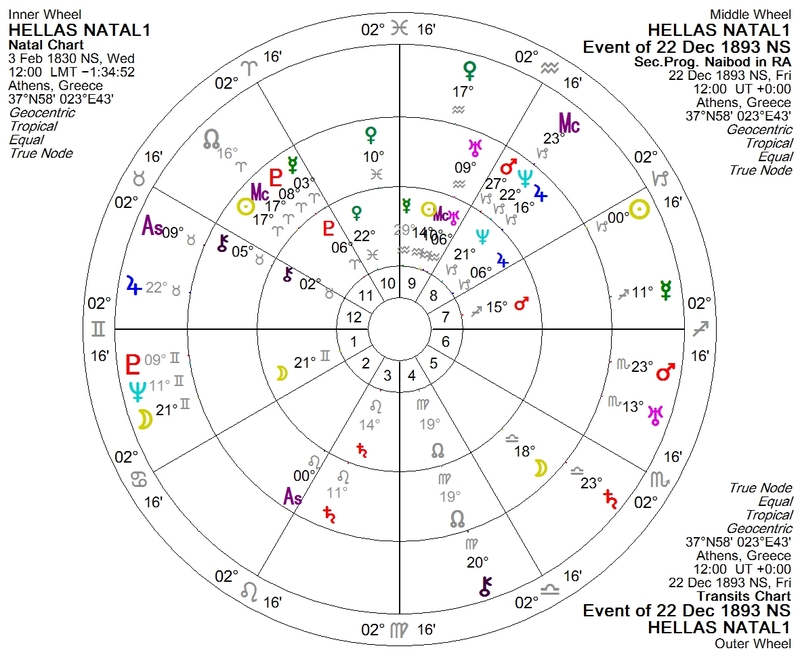 The anouncement of Mr. Papadimos as the New PM,( around 14.35 , Athens time), at the time of the Full Moon in the Taurus-Scorpio axis, signifies an end, rather than a new beginning, and is certainly not an optimistic sign. The transiting oposition of Mars to Neptune reinforces the S.A. conjunction comments we made earlier on the S.A. Mars conjunction to natal Neptune. The other transits indicate , as tr. Saturn will soon conjunct natalVenus and this will last till autumn 2012, the hardship of this undertaking as well as ‘austerity measures’ and the ensuing poverty imposed on the greek people. The transit of Jupiter in Taurus, forming a T-square with the natal square of Mercury to Pluto in the spring of 2012 ( aprrox. mid- March to mid- May 2012) will most likely be the hardest period for Mr. Papadimos- and for Greece. The decisions taken, and Treaties signed, by this Government will be indeed crucial – if not ‘terminal’- for Greece, and their full consequences will be most prominent after mid 2013 to beg. 2014. The time (14.17) has been given by the astrologer Adrian Duncan. In the above chart, the natal horoscope is in the inner circle, the progressed horoscope in the middle circle, and the transits for Aug. 9, in the outer circle. What is most striking here is the conjunction of progressed Mars, at 2.56 degrees Capricorn to the natal sun at 3.26 degrees. Prog. Mercury is part of the combination, although technically passed the conjunction to the Sun at 4.41 degrees Capricorn. Mars and Sun are both ‘fiery’ planets indicating aggression, activity,fight , but, in this case they are even mor adversely affected by the exact T-square formed by the malefics Pluto in Capricorn, Uranus and Jupiter (the latter not itself a malefic, but in this case magnifying the effect of the malefics) in Aries, and Saturn and Mars in Libra, all affecting the conjunction of progressed Mars and Mercury to the natal Sun . Uranus rules the 6th and 7th house ( health, work and everyday life affected), the Sun rules the 12th and 1st house (more than 50 deaths were caused by the fires and the death rate doubled due to the toxic cloud),Mars rules the 9th ( the fires had consequences of global nature ), and Mercury rules the 2nd ( financial consequences). The one positive point here is that the prog. Sun is forming a sextile to Prog. Pluto , indicating that in spite of the damage and harship Russia will be able to slowly recover from the blow, and , hopefully, this dire consequence of global warming will make peoples and Governments realize the seriousness of the climate change and start taking stricter measures for its control.